entlang dem Uferpfad, der am Pier beginnt. Siehe unten stehende Aktivitäten für eine ausführlichere Beschreibung. We were able to walk to all restaurants and activities in Bar Harbor. The Condo was well appointed, spacious, and clean. Although not an issue for us, guests should be aware that there are stairs to enter the apartment and additional stairs to the bedroom. The property and furnishings are very dated. It needs a deep and thorough cleaning and an uncluttering of closets and cupboards. The bed linens, pillows, and spreads need to be updated. Oh! Don't forget to bring your own toilet paper! The property is extremely well located and an easy walk to town. The property is not new. The appliances are somewhat dated but are all functional and get replaced as needed. The furniture and furnishings are all recent to new. The unit is fully equipped; storage space is limited. But if you are looking for a new and completely modern place to stay there are lots of new hotels in Bar Harbor at 2 to 3 times the price. This second and third-floor condo comprises a large bedroom with full bath on the third floor; adequate kitchen, half-bath and living room with balcony on the second floor. Decorated with photographs and art by the family of the owner, this was a comfortable base to explore Bar Harbor, particularly since it was located within a few blocks of the Explorer Bus head-end on the Village Green. We visited shortly after a heat wave and appreciated the attic fan and cross-ventilation. If our visit had coincided with the heat wave, the lack of air-conditioning would have been a major issue. The unit owner asks renters to place linens in the compact washing machine and start the wash cycle. The towels set out when we arrived, smelled slightly of mildew, probably from having sat wet in the washer before being dried. The owner has promised to let his cleaning service know. The location was perfect and the place was clean and tidy. We enjoyed our stay and appreciated the laundry and kitchen facilities. The location was fabulous and gave is a lot of flexibility to be in town or take the shuttle to Acadia. We loved the location of this townhouse as it is walking distance to everything in downtown Bar Harbor. The dedicated parking spot was a huge plus as parking can be very difficult to find. The townhouse itself is charming and made the ideal home base for us. We both needed to keep in touch with work and had plenty of space to set up laptops and do what we needed to do. The kitchen is very well equipped and so we only ate out once. (I have food allergies, so this made life much easier for us.) The unit is just a few blocks for Hannaford's grocery store so lugging groceries was not an issue. The layout of the townhouse is very cozy with the kitchen, living room and 1/2 bath on the first floor and a complete master suite on the top floor. It was very easy to relax in the unit or out on the balcony - it really is a home away from home. We had limited interaction with the hosts, but they were quick to respond and very sensitive to our needs. If ever we find ourselves back in Bar Harbor this unit will be our first choice for accommodation. 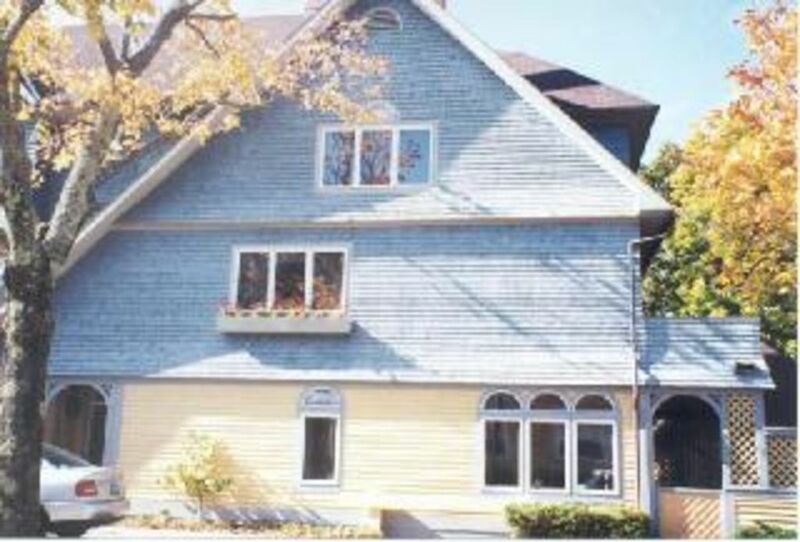 This apartment/condo is ideally situated in Bar Harbor. It is off the beaten path but no more than a 3 minute walk to everything downtown. Place was neat and clean and had some supplies for washing machine, etc. there when we arrived. There is a numbered parking spot for one car right in front of the door. There were three of us - couple with a teenaged son. Our bed in the upstairs was OK, but our son indicated that the pull-out sofa was very uncomfortable with the support bars being felt through the mattress. Consequently, I would recommend this place for two people sharing the upstairs bedroom but I would not subject anybody to the sofa bed. We also were not able to access the wifi, nor were the people in the unit next to us able to get on their wifi. This situation was not resolved during our 5 day stay and the owner did not offer any refund. I would have expected a partial refund as I would not rent a place that did not have working wifi. The renter never notified us about the Wi-Fi. We had an alternative network available he could have used. The network is fully functional now. We will look into a more comfortable hideabed for next year. Wandern und Fahrradfahren. Die Herbstfarben im Oktober ist spektakulär. stehen zur Verfügung. Boote können für Segeln und Angeln gemietet werden. Ein Golfplatz ist in Bar Harbor. Spezialität, und viele einzigartige Geschäfte und Galerien. 2019 Rates Early Season: May 4 - June 22 $900 High Season: June 22 - Aug 31 $1125 Late Season: Aug 31 - Sept 28 $950 Fall Season: Sept 28 - Oct 31 $900 Rentals are Saturday to Saturday. Minimal rentals 6 days in high season, 5 days other times Inquire for off season long term rentals. Fully refundable deposit required.